Have you traveled to a city or a country during its low season? How was it? Did you get a special discount? What was your experience when traveling on the low season? I had an unforgettable experience when I was traveling to Luang Prabang, Laos, during its low season on October. I had taken a look some travel forums and read the reviews of some travelers before I departed to Luang Prabang. It took me a while to search for the most convenient place according to my expectation and, of course, my budget. After reading some reviews, I decided to select one guesthouse. 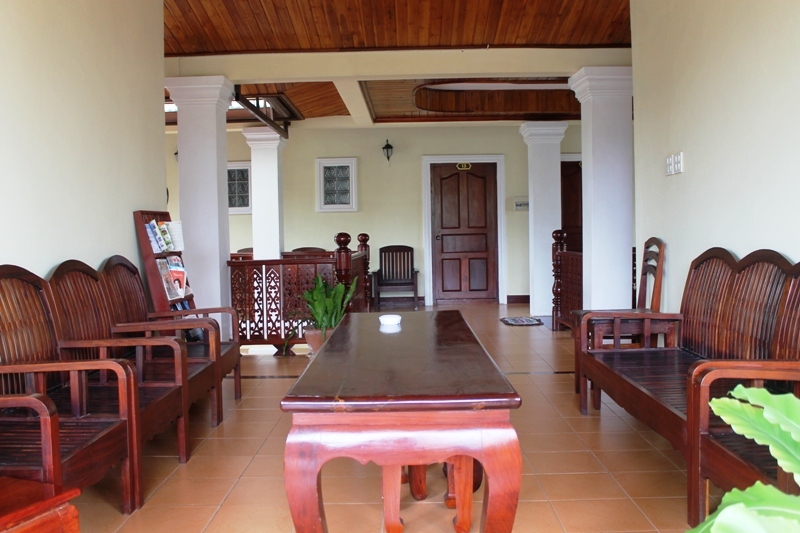 The key words for the guesthouse that caught my eyes are cleanliness, quietness, and its central location. The guesthouse also provided free bikes and free pick up. Free pick up was my other keyword as it was my very first visit to Luang Prabang and I traveled solo. I wrote to the guesthouse and the owner, Mr. Kamphone, responded himself to my inquiry. He gave me a discounted price for the room for it was the low season. It was a deal. I gave him my arrival date and flight information. Mr. Kamphone said someone would pick me at the airport carrying a paper with my name on it. I thought everything has been set. The day was coming. I arrived in Luang Prabang airport whose architecture has strong Laotian influence. I had no issue with immigration and baggage claim. It was fast and easy. I exited the airport but nobody showed up carrying cardboard with my name at the meeting point. I looked around but the guy with my name was not there. Some taxi drivers offered me their service. To my surprise, they were not aggressive. I re-entered the airport and waited for a while. It was a hassle-free airport with some kiosks for money changer, local SIM card, souvenirs, and drinks. I looked around again one more time when the minute hand of the clock was striking to number 6. It’s been 30 minutes now. It was strange that Mr. Kamphone forgot to send someone to pick me up. Anything could happen. So I approached the local SIM card counter. There are 3 Laotian women attended the kiosk. I explained my situation to one of the ladies. I asked her to call the phone number that Mr. Kamphone gave me. The lady made a phone call and I heard on the other side a man’s voice. “He is coming,” the lady said after ending her conversation on the phone. I was grateful for her help. Fifteen minutes later, Mr. Kamphone showed up. He shook my hands. His smile radiated warmth. Mr. Kamphone was sorry for forgetting to pick me up. Luang Prabang had been an ancient royal capital of Lan Xang Kingdom until King Phothisarat moved the capital to Vientiane in 1545. Laos fell under French administration from 1893 to 1954. Then, it has become a democratic republic since 1975. 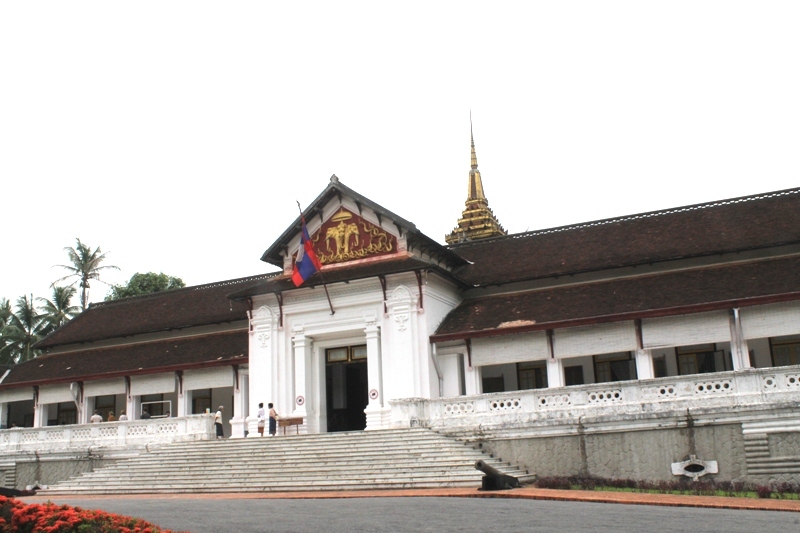 Luang Prabang has been the UNESCO Heritage city since 1995. Like Indonesia, the country’s climate is tropical with only two distinct seasons, rainy and hot seasons. I came on a dry season which started from October to April. “Please come in,” said Mr. Kamphone when we arrived in the guesthouse. A young man with an Army haircut took my luggage and carried it to the second floor where my room is located. 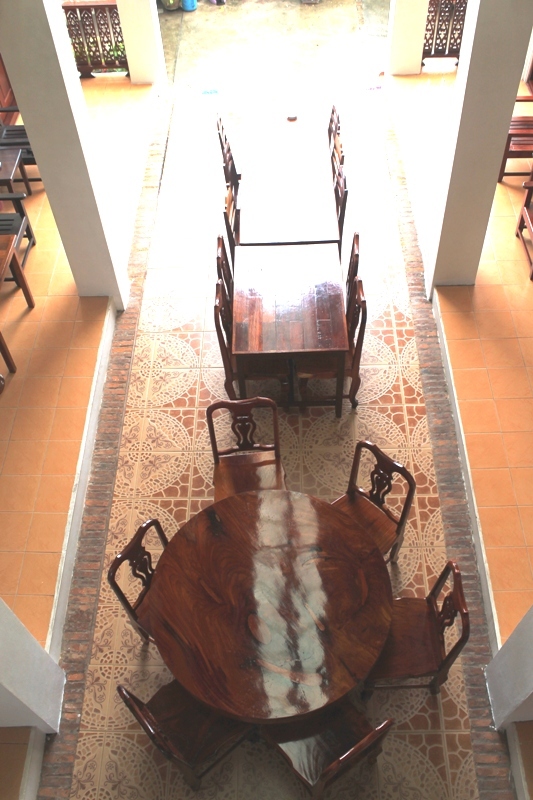 It is a two-story guesthouse. The whole building looks stainless, I didn’t see any specks of dust covering all teak furniture. The floor was so clean that I could see my body reflected on it. 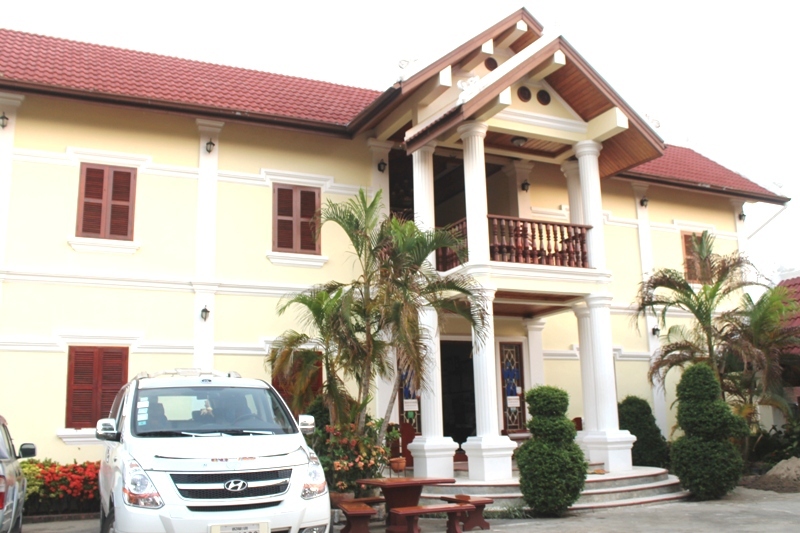 The cleanest guesthouse I have ever stayed in theentire Southeast Asian countries. The guesthouse is deserted. Before I asked about it, Mr. Kamphone already said, “It is low season now.” No wonder, he forgot to pick me up. The reviews were right about cleanliness in the guesthouse, my room was spotless. The all teak furniture in my room look shiny. The teak windows look as if they are cleaned every day. The windows have an unstained curtain. The ceramic floor was dirt-free, the bathroom was neat and in a good shape. 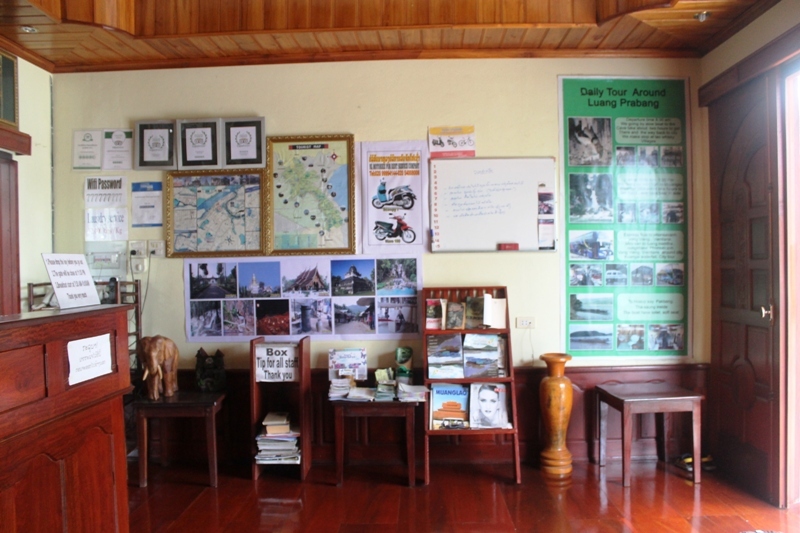 It was the cleanest guesthouse I have ever stayed in my entire trip in Southeast Asia. All rooms are cleaned every day despite the lack of guests. All the rooms in the guesthouse were empty, I was the only guest there. The guesthouse became my real home for four nights of my stay. The young man who took care of the guesthouse slept in there. The lady in the kitchen and Mr. Kamphone would go home every day. One of my important missions to travel to Luang Prabang was to see the traditional alms giving ceremony for Buddhist monks. Mr. Kamphone earlier told me that the ceremony started at 5 am and it took place right in front of the guesthouse. He also told me where to pick up the key for the main door of the guesthouse. As I was the only guest, I would be the first who got up in the morning. I set my alarm at 5 am for the next morning so that I would not be late to witness the ceremony. As the alarm rang, I got up from my bed, washed my face, grabbed my camera and then went straight downstairs. I succeeded to unlock the key of the thick main door. But when I wanted to go out, I found the front gate was locked. Oh Boy! 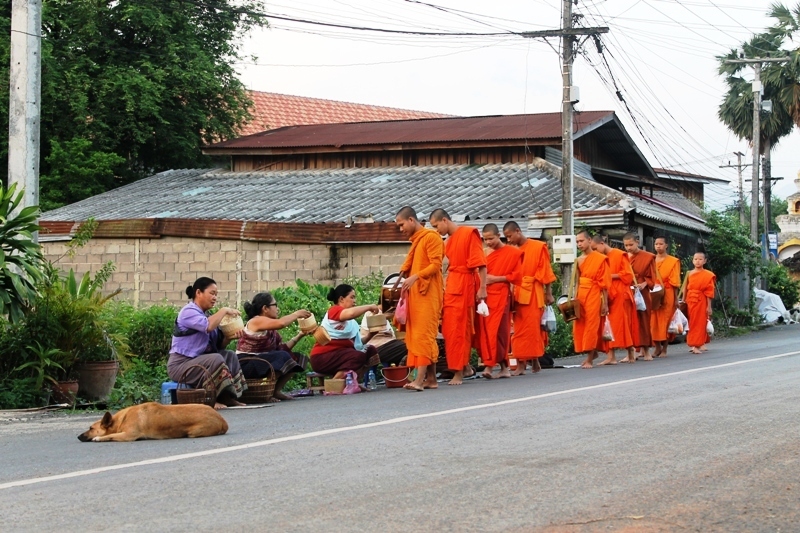 A group of young monks in saffron gowns was walking in one line to the direction of the guest house. In front of the guesthouse, I saw some ladies already sat in low chairs. The ladies carried rattan baskets filled with food that they would give to the monks. The guesthouse caretaker must have the gate’s key, but he must be asleep now. I could not go out. The monks murmured the prayers as they were walking. I lost some photographic moments. Then, I could not help but climbed the gate so I could stand on the gate to see the ceremony. My left hand held the fence and my right hand holding the camera. The monks were walking in a line carrying their bowls. The ladies who sat on the roadside put the food into the bowl while bowing their heads down. The monks were saying a prayer as long as the procession. There were some other groups of monks that stood in a long line. The monks were young and old. The procession took about one hour. By 6 am the monks started to return to their temple, walking. It was so mesmerizing to see the entire procession. When the procession was about to finish, I saw the young man who happened to barely get up hurried to the gate. He unlocked the keypad. The following days, the gate was unlocked, and I could get out of the guesthouse in the early morning. Mr. Kamphone’s guesthouse is unique. When I stay in a homestay or a guesthouse as the only guest, I usually receive half-hearted service. In his guesthouse, one guest counts. The lady served me a simple breakfast every morning. The bikes were there. Mr. Kamphone arranged my car. And I didn’t pay any commission for that. The guesthouse’s caretaker worked tirelessly. He cleaned all empty rooms and wiped every single thing with a cloth. Everything is business as usual. That being said, I prefer my stay, especially in Mr. Kamphone’s guesthouse, during low season. It was quiet. The service was not different from the high season. Most of all, I felt like I owned the entire guesthouse.